Drive around the “Three-Cultures” Plaza, where the three epochs of Mexico are represented (pre-Hispanic, colonial and modern). Visit to the new Basilica where the original image of Mexico’s Patron is found. The temple was built in 1976 by the architect Pedro Ramirez Vazquez. The first temple, built at the top of the Tepeyac mount on the XVI century and the old Basilica dating from the XVIII century, can be admired from the great atrium. 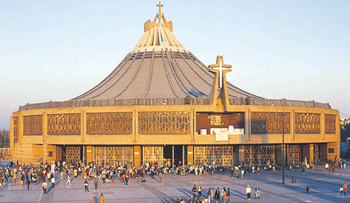 Every December 12, hundreds of thousands of Mexicans come to this place in pilgrimage to worship the Virgin. Departure for Teotihuacan (“The Place of the Gods”), 53 kilometers from Mexico City, approximately 1 hour’s ride. 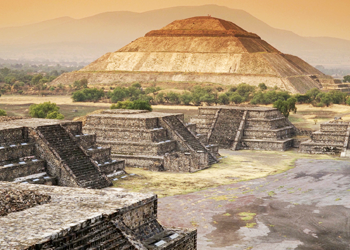 Visit to the archaeological area that was the seat of the Teotihuacan culture. Visit to the Quetzalcoatl Temple, the Sun Pyramid, the Quetzalpapalotl Temple, the Feathered Snails Temple and the Moon Pyramid, from where the amazing Avenue of the Dead can be seen. We guarantee this will be one of your most memorable visits of mexico. – Regular services and fare guaranteed only with minimum 2 passengers.